In May 2008, postal workers in Mohnton, Pennsylvania, heard noises coming from inside a package. Pictured are just some of the foreign beetles that were found alive inside that package. By using the collections maintained by ARS’s Systematic Entomology Laboratory, scientists were able to confirm the identities of the beetles, which included species native to Asia, Australia, Central and South America, and Papua New Guinea—but not to the United States. Many people find insects annoying. But to researchers, understanding these creatures plays a significant role in protecting American agriculture. That’s why the Agricultural Research Service maintains invertebrate collections all over the United States. The invertebrate germplasm collections are unique because, unlike other ARS collections, scientists maintain them by continuously rearing live specimens. They serve as genetic resources of insects and arachnids important to agriculture. Our largest collections are located in Manhattan, Kansas; Stillwater, Oklahoma; Fort Collins, Colorado; and Fargo, North Dakota. 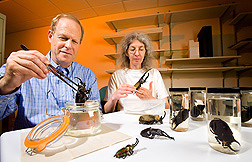 Scientists use the invertebrate systematics collections, which are composed of preserved dead specimens, to help identify and verify insects and mites that are of economic importance and are used in research. ARS has four major collections—each housing more than 500,000 accessions—located in Beltsville, Maryland, and Washington, D.C.; Logan, Utah; Stillwater, Oklahoma; and Newark, Delaware. The insect and mite collections at Beltsville and D.C. belong to the Smithsonian Institution as part of the U.S. National Arthropod Collection. It was the spring of 2008. 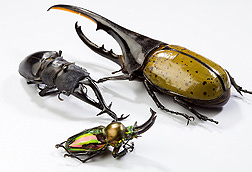 The rhinocerus, hercules, and king stag beetles—some 6 inches in length—arrived at ARS entomologist Natalia Vandenberg’s office in the National Museum of Natural History in Washington, D.C., dead (having been frozen) but impressive nonetheless for their size and beauty. U.S. Customs and Border Protection (CBP) officials had sent the beetles after postal workers in Mohnton, Pennsylvania, heard scuttling noises inside a package from Taiwan. As an expert on the insect order Coleoptera, Vandenberg was asked to officially determine the beetles’ identities, which included species native to Asia, Australia, Central and South America, and Papua New Guinea—but not the United States. Left, giraffe stag beetle, Prosopocoilus giraffa; right, hercules beetle, Dynastes hercules; bottom, king stag beetle, Phalacrognathus muelleri. “Foreign beetles represent a potential threat to agriculture and the environment, and therefore their shipment into the United States requires special handling and permits,” says Vandenberg. But no such permissions accompanied the Mohnton package. Instead of toys, gifts, and jellies as the label claimed, CBP inspectors found more than two dozen live beetles, including males and females. Needless to say, the insects never reached the intended recipient. 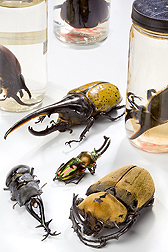 And while the beetles ultimately met their demise, they’ll live on in posterity as a permanent part of the museum’s National Entomological Collection. The 100-year-old repository, which contains 35 million insect and mite specimens, is maintained by experts from the Smithsonian Institution, U.S. Department of Defense, and ARS’s Systematic Entomology Laboratory (SEL), where Vandenberg works. SEL research leader M. Alma Solis estimates that SEL staff identifies 35,000 specimens annually, in support of federal agencies, academia, and state agriculture departments. Located in both Washington, D.C., and Beltsville, SEL researchers also investigate the biology, taxonomy, distribution, and origins of newly detected and established species. Thanks in great part to USDA’s long-term collaboration with the Smithsonian, “The U.S. National Collection is one of the best resources in the world to support identifications and research affecting trade, quarantine issues, biological control, and other aspects of agriculture,” says Solis. At the Wheat, Peanut, and Other Field Crops Research Unit in Stillwater, Oklahoma, entomologist John Burd spends his days surrounded by insects—thousands of them. Burd manages two important collections of insects that affect cereal crops such as wheat and barley. The Aphid Biotype and Natural Enemy Collection contains more than 100,000 specimens. Biotypes occur when there is a genetic change in a pest, normally a result of sexual reproduction. This genetic change can allow the insect to damage plants that were previously resistant. 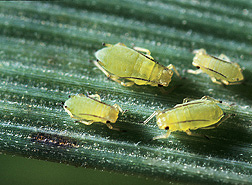 Each aphid biotype has a unique phenotypic fingerprint—the way in which it damages a specific group of resistant and susceptible plants—that allows Burd to tell them apart. Burd also maintains live colonies of all the known biotypes of two of the most economically important pests of cereal crops—the greenbug (Schizaphis graminum) and the Russian wheat aphid (Diuraphis noxia)—in the Cereal Insects Genetic Resource Library. These insects have been known to cause millions of dollars in crop losses annually. The collection was used during a Russian wheat aphid outbreak in Colorado during the 2003-2004 growing season, which damaged many fields. Specimens in the collection allowed scientists to quickly determine that the biotype was not a new introduction to the country. This saved time and helped the scientists understand pest resistance differences and come up with solutions, including developing resistant cultivars. Cryopreservation and cold-storage technologies are important tools used in long-term preservation of insect germplasm. ARS entomologist Roger Leopold at the Insect Genetics and Biochemistry Research Unit in Fargo, North Dakota, has co-written a book chapter with ARS biologist Joe Rinehart, also at Fargo, on the lab’s achievements on insect cryopreservation. In Lincoln, Nebraska, visiting entomologist Roger Leopold (from Fargo) places screwworm embryos in a liquid-nitrogen storage unit headed for Fort Collins, Colorado. 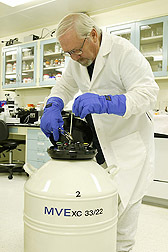 Cryopreservation is the process of freezing and storing an organism in liquid nitrogen without killing it. Their lab’s successful cryopreservation of the house fly led to the development of a protocol for cryopreserving screwworms, a devastating insect pest that burrows into and eats the flesh of warm-blooded animals. “Insect strains” are species with special properties that either occur naturally or have been developed for a specific research project. The strain is often discarded after completion of the work. As a result, researchers must often redevelop or reisolate strains for new projects. Continuous colonization of all strains is costly. Developing technology for their cryopreservation and establishing a national repository for long-term preservation of insect germplasm would be a practical solution to this problem, says Leopold.—By Stephanie Yao, Jan Suszkiw, and Alfredo Flores, Agricultural Research Service Information Staff. "Our Invaluable Invertebrate Collections" was published in the January 2010 issue of Agricultural Research magazine.